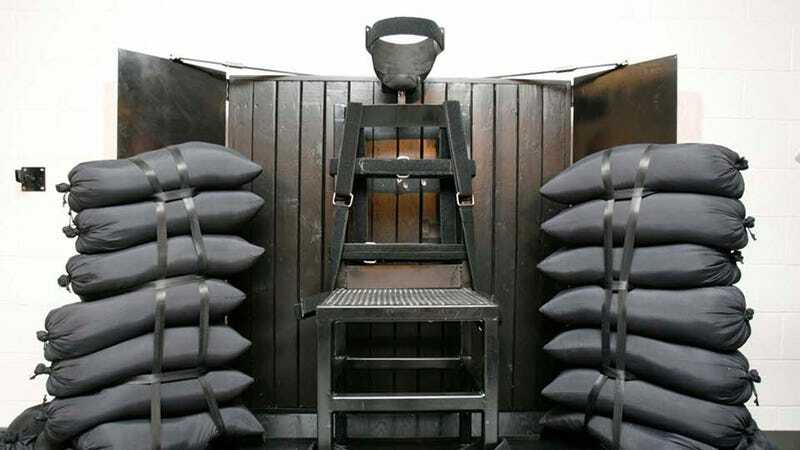 Utah lawmakers are prepared to strap condemned criminals to this horrible chair and shoot them if they need to. They've just approved a bill that would allow the state to execute people by firing squad if there's a shortage of lethal injection chemicals needed to kill people the socially acceptable way. The New York Times reports that states across the country are struggling to keep their lethal injection inventories up as European manufacturers have refused to sell them them the chemicals. The bill in Utah is largely a just-in-case measure for now; there's no imminent need for a firing squad. But in other states, the problem is more pressing: If Texas proceeds with two executions next week, it'll be out of chemicals. Utah Governor Gary Herbert hasn't said whether he'll veto the bill or not, and it could be weeks before he decides. Firing squad executions sounds horrible and regressive and inhumane, but let's not forget more than a few recent lethal injection executions have been botched, leaving the condemned hanging between life and death for hours. If we agree that as a society we're going to kill people, there's something to be said for making it as quick and clean as possible. If the firing squad yanks at your conscience, maybe the whole institution of capital punishment ought to as well.